President Trump speaks at Joint Systems Manufacturing Center in Lima, Ohio, on Wednesday. His speech included a five-minute attack on the late Sen. John McCain of Arizona. President Trump went to Ohio yesterday - Lima, Ohio - to talk about rebuilding the military and bringing back jobs to the state. He also spent five minutes attacking the late Senator John McCain, a celebrated Vietnam veteran and prisoner of war. Among other things, the president slammed McCain for failing to pass a bill that would have expanded VA services, which the senator originally sponsored. NPR's Quil Lawrence reports on reactions to the president's rhetoric. QUIL LAWRENCE, BYLINE: It's not the first time the president has picked a fight with John McCain. It was the first major fight, though, since John McCain died of brain cancer seven months ago. Trump called the dead senator ungrateful. PRESIDENT DONALD TRUMP: And I gave him the kind of funeral that he wanted, which as president, I had to approve. I don't care about this. I didn't get thank you. That's OK. We sent him on the way. But I wasn't a fan of John McCain. LAWRENCE: It's actually Congress that approved most of the arrangements, though the White House did allow government transport of McCain's body. 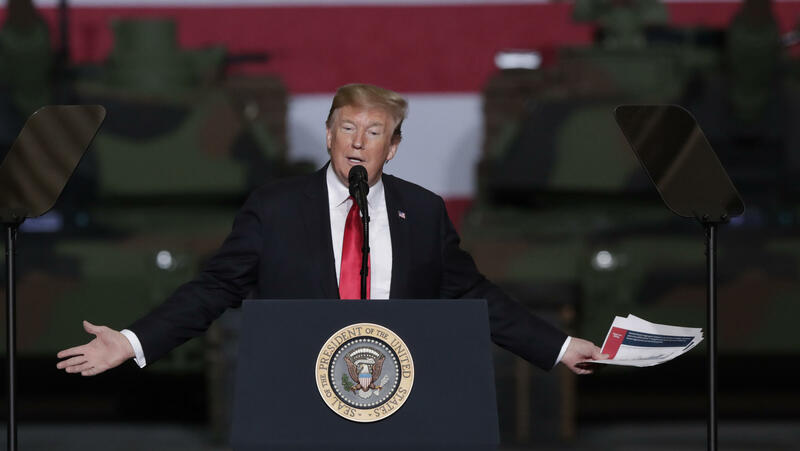 At his speech, Trump criticized McCain's support for wars in the Middle East and the Arizona senator's decisive vote against repealing Obamacare. And he also repeated a false claim about McCain's role in VA reform. LAWRENCE: The president was referring to a law passed last year. Its abbreviated name is the John McCain, Daniel Akaka and Samuel Johnson VA Mission Act, which has not been 45 years in the making and is named after John McCain. The original Veterans Choice law to increase access to private care, McCain co-sponsored that law five years ago, not 45 years ago. Veterans groups have been quiet about the president's most recent broadside. LINDSAY RODMAN: Our membership is varied. We have many members who are strong President Trump supporters, and we have some members who oppose him. RODMAN: John McCain's service was so extraordinary and exemplary, being a prisoner of war for as many years as he was in Vietnam is the type of trial and tribulation that very few of our veterans may have experienced. And I fear that some of them may be asking themselves, if John McCain's service has come into question, does that mean that the president doesn't appreciate their service and some of the sacrifices that they've made for this country? LAWRENCE: The veterans group AMVETS said it was disheartened, but the other major vets organizations declined to comment. That was also true of many Republicans in Congress. The most notable exception was Georgia's Johnny Isakson, chairman of the Senate Veterans Affairs Committee. He spoke with Georgia Public Broadcasting after the president's comments. JOHNNY ISAKSON: It's deplorable what he said. It will be deplorable seven months from now if he says it again. And I will continue to speak out because there's one thing that we've got to do. We should never reduce the service that people give to this country, particularly in the offering of their own life. LAWRENCE: Many Democrats and left-leaning vets took to social media with critical memes and rants, perhaps hoping to bait the president into another round of tweets about the late senator, which even Trump's allies have said probably do not help him. Quil Lawrence, NPR News. Transcript provided by NPR, Copyright NPR.